Fulbright Finland Foundation organized the 8th expert study tour to the United States under the theme “Towards Sustainable Arctic Futures.” The program took place in Alaska and coincided with the transfer of the Arctic Council Chairmanship from the U.S. to Finland. Explore Fairbanks: tips for shopping, restaurants, things to do etc. In conjunction with the 10th Arctic Council Ministerial Meeting in Fairbanks, Alaska, the United States handed over the chairmanship of the Arctic Council to Finland on May 11, 2017. To kick off Finland’s Chairmanship in the spirit of collaboration and partnerships, the Fulbright Finland Foundation brought a ten-member multidisciplinary expert delegation on a study tour from Finland to Alaska for the week of the interchange. The tour addressed the Foundation’s key strategic priority area, the Artic, as well as the Foundation’s fundamental purpose of promoting a wider exchange of knowledge and professional talents through educational and scholarly contacts between Finland and the United States. This study tour took our delegation from Anchorage to Healy, to Denali National Park and finally to Fairbanks. >> Download the Study Tour program booklet (pdf) here. >> View the photo gallery from the Study Tour here. The group led by Fulbright Finland included representatives from the Thule Institute of the University of Oulu, University of Eastern Finland, Turku University of Applied Sciences, Finnish Meteorological Institute, Aalto University and the Ministry of Foreign Affairs of Finland. 8:30-16:35 | Aurora Winter Train to Healy via Denali Park. Participant introductions, team building. Karen is alumna of the Fulbright Distinguished Awards in Teaching program and works as Instructional Coach and Elementary Teacher at the Tri-Valley School, in Denali Borough School District, in Healy. She is also a PhD student in the Interdisciplinary Program at the University of Alaska Fairbanks (combining theories of sociology and psychology with educational studies). All day tour of Denali Park. Themes: nature conservation, climate change, team building. Dave grew up in New Jersey and spent several years of his childhood living in Kyoto Japan. He studied ecology as an undergraduate and became enamored with national parks during a summer trip to the Western United States. Dave spent the first 13 years of his National Park Service (NPS) career as a seasonal ranger, traveling from park to park working 4-6 month seasons. Dave’s first season in Denali was 1984, where at an impressionable, young age he imprinted on the park and decided it was the center of his universe. Dave currently manages the park’s Science and Resources Team, a group of 20-35 scientist and scholar that study park’s physical and biological resources along with its history, ethnography, and archeology. Excitement in Fairbanks when Finland takes over the Arctic Council Chairmanship! Opportunities to showcase Finnish research and innovative projects with audience around the Arctic countries! Networking and sharing of best practices with experts! New information on arctic priorities, innovations and research! Exploration of nature conservation at Denali Park! Estimated Study Tour costs per person will be approximately 3 500 EUR in addition to flights (with arrival to Anchorage and departure from Fairbanks). 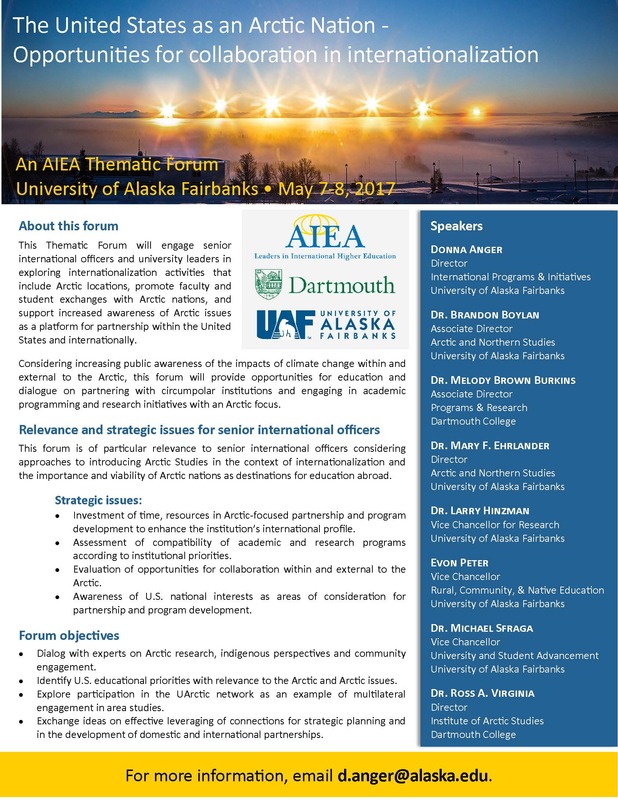 The sum includes the following program related costs in the U.S.: accommodation, local ground transportation (including Aurora Winter Train to Healy), visit to Denali National Park, selected meals and coffees, meeting room and material costs, and all organizing costs related to the Study Tour program. In addition, participants or their home organizations are responsible for paying and arranging flights, per diem (if applicable), taxi from the airport to the hotel upon arrival and from the hotel to the airport for departure, as well as travel insurance with proper coverage for travel in the U.S.
During Fulbright Study Tours, the actual participation costs will depend on the number of participants (shared costs are divided among participants), site visits included in the final program (transportation, potential seminar or speaker fees and other costs related to the selected site-visits), and the exchange rate. Closer estimate of the participation costs will be shared with the participants once the number of Study Tour participants has been confirmed and the program finalized.